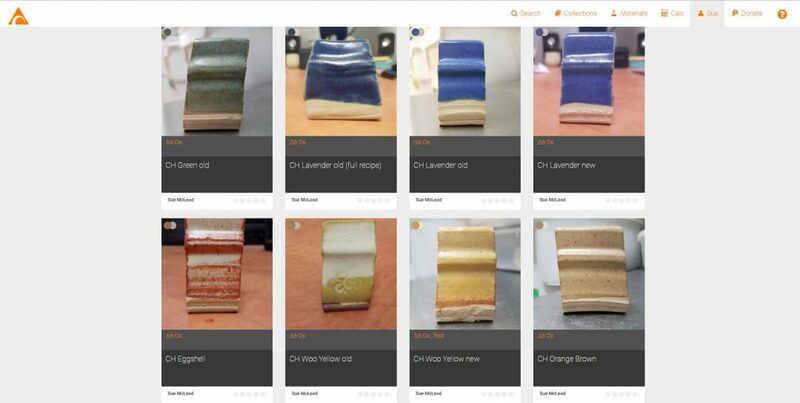 Glazy.org is a website where users can upload their ceramic recipes with images, to share with the ceramics community. Anyone can create an account for free. You can search for recipes based on colour, texture, temperature and more. Each recipe is converted into its Unity Molecular Formula and plotted on a Stull chart for further analysis. There are currently over 5000 recipes contributed by ceramic artists from around the world. Glazy is an open source website created by Derek Au, who is constantly improving it so that it suits every type of need. Derek has put countless hours of his free time into this massive site, which is completely free for users. If you love Glazy, consider making a one time or monthly donation to contribute to the costs of running the site. You’re commenting on a post about the glazy.org website. Are you asking about my NCECA presentation on cone 6? If so, I haven’t studied other temperatures but the principles of the Stull chart are the same at all temperatures. Just found your site… trying to figure out if there is some way to create a file or bookmark glazes that I am interested in? Glazy.org isn’t my website, I’m just sharing it because I think it’s a wonderful resource! Yes, you can bookmark glazes once you have created an account.